We heard the alarm this morning and caught the bus to Puerto de la Cruz. From there we took a bus to La Caldera above Orotava. Bill went hiking here in 1998. La Caldera is at 1200 metres so we are right in the cloud belt. Teide is probably in brilliant sunshine. I really meant it when I said we were in the clouds. This is a real rainforest and some of the plants are huge. This southistle is 2 metres tall. You can see the raindrops hanging on the pine needles above it. 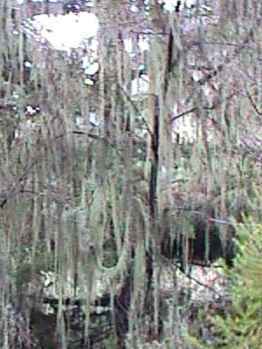 Trees festooned with Spanish moss. Even the heather grows as big as trees. 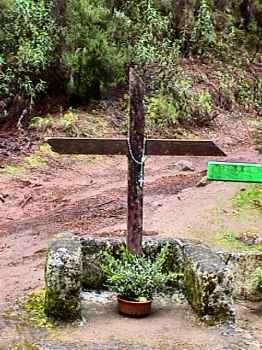 Crosses on the Pilgrims' Way from Puerto de la Cruz to Candalaria on the south coast. This cross looked alright; the other 2 were painted neon green!?. The Pilgrims' Way. The tree on the right is eucalyptus. 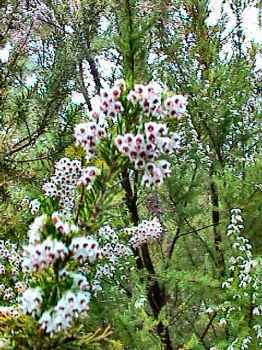 Many foreign trees have taken over the habitat of the native Canary pines. 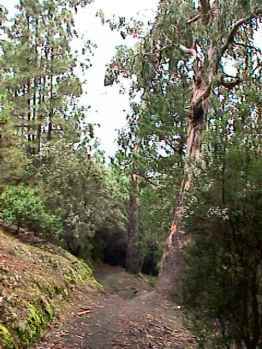 Recently more effort is being put into re-establishing the pines which play a major role in Tenerife water supplies. 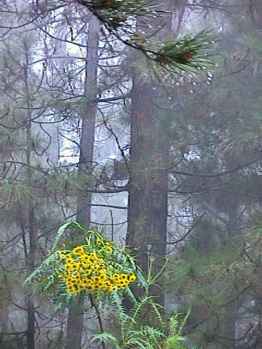 Raindrops on a Canary pine. Water condenses out of the fog onto the long needles, about 20 cm (8 inches) long of the Canary pine and drip onto the ground. 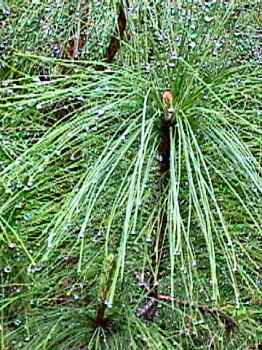 A mature pine collects about 2000 litres of water per year. The water filters through the porous lava and collects in natural underground reservoirs. Galleries several kilometres long have been built into the mountain to collect the water. 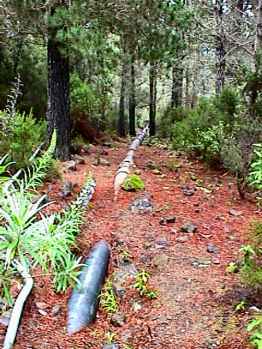 This is one of several pipelines taking water to Orotava and Puerto de la Cruz. In earlier centuries, canals carried the water. 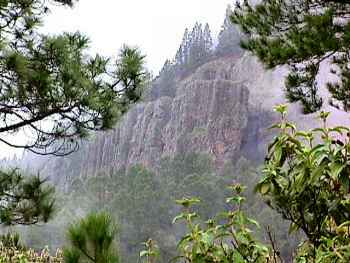 These basalt columns near La Caldera are called The Organ. Bill had missed seeing them in 1998 (he was too close to the base of the cliff) and we were afraid we would miss them again because of the fog. But it lifted for a few minutes just when we were at a lookout.